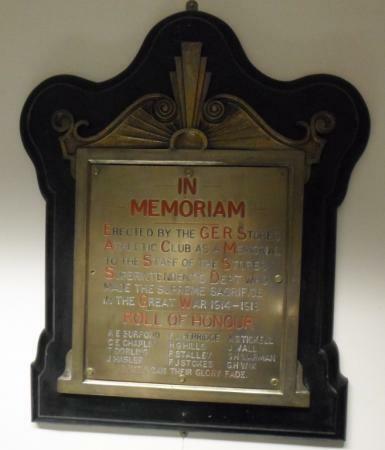 In October 1921 a memorial was unveiled to the 12 employees of GER Stores who had been killed in World War One. The memorial was a new sports pavilion, called the Memorial Pavilion, built in the GER Sports Grounds at Gidea Park. The pavilion contains a brass tablet with the names of those who fell. The dedication ceremony was led by the Bishop of Barking and The Rev C Steer MC who was the vicar of Hornchurch. Since the memorial was commissioned there have been several changes of management in the railways and the GER stores are no more.